What is the Forest Stewardship Council®? The Forest Stewardship Council® (FSC®) is an international, non-governmental organisation dedicated to promoting responsible management of the world’s forests. Independent inspections of forests are carried out by third parties such as BM Trada, and they must adhere to strict standards of environmental and huminatrian forest management. On passing this inspection a forest can then be awarded a Chain of Custody certificate. This FSC® Chain of Custody allows the timber or wood product to then be tracked throughout the whole supply chain, from its source, to the end customer. An industry certificate of this kind from the FSC® ensures any global customer can feel confident their product has been procured from a responsibly managed forest. BM TRADA, an internationally renowned organisation has passed GPP as FSC certified®, (Forest Stewardship Council®) cert TT-COC- 003044, license code FSC-C007145. 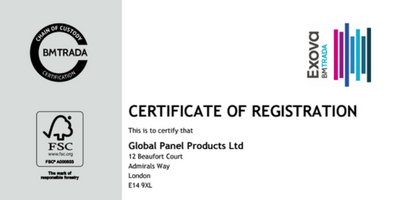 Global Panel Products have been awarded this certificate because we’re a company who can demonstrate that our products are sourced from well managed forests. The FSC® chain of custody certification scheme ensures Global Panel Products do not knowingly source forest products that have been illegally harvested. A chain of custody certification scheme also means Global Panel Products does not source wood from uncertified high conservation forests, or from areas where traditional civil rights are violated. In addition, we do not source timber from natural forests that have been converted to plantations.